Arkane's stealth action game lives up to its early promise. There's a certain dignity to Dishonored, though it's not to be found in the high-society masquerade party that houses the most recent playable demo of Arkane's stealth-minded action game. The dignity is in the details and in the design, in its noble intentions and in its respect of the player and their choices. Dishonored's a game that promises its players the world, and at times it looks damn close to being able to gift it to them. But the first thing to hit you about Dishonored is its majesty, even if it is a willfully scuffed, frayed splendor that Arkane has created. Dunwall's an intoxicating construct, and the fingerprints of one of its grand architects, visual design director Viktor Antonov, are smeared across the city. Monolithic black steel gates crash awkwardly against 19th Century townhouses and sheer concrete walls. This is City 17 under Queen Victoria's rule. In Dunwall, filth washes up against the walls of stately homes, and it's amidst this flotsam that the lead character of Corvo conducts his business. Framed for the murder of an Empress, Corvo's offered a chance to exact revenge on those who set him up, and does so from the squalor of Dunwall's dank shadows. In the level at hand, a mission to infiltrate Lady Boyle's party in order to assassinate her, dark streets encircle a grandiose and richly lit mansion that plays host to the festivities. These streets are grey and grubby, patrolled by coughing beggars, sword-wielding guards and a single Tall Boy, the elite armoured units that, with their stilts, feel like spindly descendants of Half-Life 2's Striders. Inside the mansion it's a different world altogether. A tall central hallway, built of porcelain and gold leaf, branches out across several floors and extends into an opulent garden. On the ground floor, the party spills into the side rooms and the studies; in each corner there are gossiping groups wearing freakish masks - a grotesque whale is caught in scandalous conversation with an over-sized infant. Downstairs, kitchens and cellars are laid out in thick, worn oak, while servants relay strange meats to and from the party. Upstairs, dimly lit galleries of oil-painted canvas are protected by mobs of guards, while discarded nightwear is casually tossed across the floor of one of the grand, empty bedrooms. Dishonored boasts a real sense of place, and a sense of your place within it. For me, it's something that other like-minded video game spaces have lacked; for all of Rapture's beauty, I still felt as if I was being funneled from one gunfight to another rather than exploring a place that had been lived in. Dunwall, on the other hand, feels utterly alive. It's alive with possibility, too, and the authenticity with which Dunwall has been conjured makes your exploration of it often feel truly subversive. Levels are self-contained sandboxes that are designed, it seems, to accommodate any play-style, and it's here that the comparisons to Thief bear most weight. Outside in the streets you can dash across rooftops using a short teleport enabled by the Blink power, or scurry with the rats through damp gutters. You can confront those guards or concoct comedic demises by slowing down time and possessing their bodies. You can fight the Tall Boy, or simply skulk past in the shadows. To infiltrate the party you can sneak through high windows, pick up a discarded invite or use cold, brute force. You can mingle with guests, eavesdrop on conversations or simply stalk the grounds and soak in the grandeur. Upstairs you can loot the art, or direct guests or guards into the deadly Wall of Light that shields the stairs. You can seduce your mark and lead her to a bedroom for a silent, lonely kill, or you can coerce with a fellow guest to save her. Outside in the garden you can tick off a side-quest by engaging in a pistol duel with a wolf-masked guest; inside, you can unleash a horde of flesh-eating rats on those that have gathered to gossip. Gallery: Abilities can be upgraded, but by and large RPG elements remain in the background in Dishonored. You can, it seems, take any path your imagination leads you on, and Dishonored's real triumph would appear to be how it allows you to play on your own terms rather than fussily insisting you stick by its own. 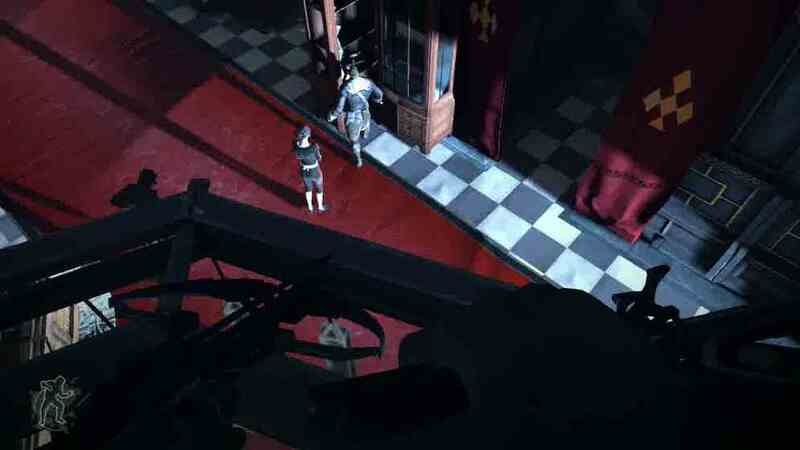 It helps that you're improbably empowered; some stealth games highlight your vulnerability but Dishonored uses it as a way of exploring your supernatural talents. This is stealth as seen in Splinter Cell: Conviction or Arkham Asylum rather than that of stricter games. Vision cones are generously slight, and there's always ample space to hide - and regardless, the tools at your disposal always keep the odds firmly weighted in your favour. There's little scope for frustration here, and it's not a game spent hiding behind a barrel for any great length of time - instead, Dishonored simply invites you to explore the possibilities. And the greatest promise that Dunwall holds isn't just in its exquisite art and the brilliantly twisted world that it summons. It's the promise that Dishonored's the kind of game that can generate countless stories led by the player, and it's here where its lineage - one can that be traced back to System Shock, to Thief and to the heyday of Looking Glass - is felt the strongest. If it can be properly fulfilled throughout the entirety of Dishonored, then this could be something very special indeed. Best served cold: The original and all DLC reviews, to mark the GOTY Edition's release. Arkane Studios says the Dishonored series is "resting right now"
Dunwall it can for the moment. Arkane co-founder Raphael Colantonio: "Imagine not having a vacation for 18 years"
Planning a life after the "long non-stop run" of triple-A development.